Have you ever dreamed of becoming a cross stitch designer? Of opening your favourite needlework magazine and seeing YOUR design featured? Or walking into a store and seeing your products on sale? Of becoming a household name? "Stitch Your Own Business" will help you to turn your dreams into reality. There is no time like the present! You can download this ebook directly onto your computer and get started right away! The book concentrates specifically on helping you with the day-to-day tasks involved in getting a range of designs out there into the marketplace. From finding out what people really want to stitch, to how to get honest feedback on your designs - not just a nod and a "That's nice dear" from your partner. You will learn all about the different ways to promote your products, off and online. Where to advertise, and how often. How to keep the rest of the family "onside" during your early days, before you start to see the money coming in. You will even find insider information on making the best of shows and exhibitions. In order to give you the best chance of success I drafted in another cross stitch designer, Shan Harris, to give you her viewpoint, as some of her methods differ from my own, and this way you get to choose which would work best for you. This 121 page ebook took me 2 years to write. It condenses 15 years of running my own needlework business into the bare essentials. It is not padded out with fluff, but packed with information that will give you a head start and help you to avoid the mistakes I made. This information will save you time, effort and money! Becoming a cross stitch designer has never been so simple. It is yours, along with two bonuses which I will discuss later, for just £19.95. I have read your ebook from cover to cover three times and am most impressed. It is thorough, friendly and very, very informative. A great deal of this I have found out by trial and error and you have gone much further down the line that I intend to go. The friends and contacts I have made have been invaluable and an unexpected bonus. I have also got to know a number of designers as friends which again is very special. You have highlighted the benefits and also the pitfalls as well as giving sound basic advice from two different needlewomen with very different approaches. I will look more carefully at my paperwork as a result of your book and I will be better organised (probably not!! - ask my husband!) but thank you both for a very worthwhile project and I hope at some point our paths will cross. What type, or types, of needlework are you going to design? Will you sell kits or patterns? Who will your customers be? This chapter is all about designing your patterns. This chapter covers choosing your design software in detail. Just so you don't have to wait until your software arrives, you will find some useful 11 and 14 count graph papers in the bonus section, when you purchase and download your copy of this ebook. Designing the kits is only part of the story. How do you get them to the market place? How do you know what is popular? How do you keep your costs as low as possible? Inside Chapter 4, I'll enlighten you with my experiences, illustrate tools that may assist your production, and offer guidance in case you are having others make your kits up for you. Let's try adding some shoe leather to the sales pitches, and getting yourself out into the public. Shows and exhibitions offer an opportunity that shouldn't be missed. You are now a cross stitch designer and you need to tell the world! Giving a talk enables you to interact on a personal level with an audience. Talking to them about your love and passion helps to get your name out there. How can you benefit from giving a talk? Have a passion to teach, but missing that vital Degree? You don't necessarily need one! People are looking for informed individuals, experts in their field to pass on their knowledge. As a cross stitch designer you are ideally placed to teach what you know to others. It is enjoyable, profitable and gives you another string to your bow. In the next chapter I share my secrets to making a success of your teaching engagements. In Chapter 8 I shall share a wealth of information on how to build yourself a successful web site - not a get rich quick scheme, just a true and honest base to truly set you on the road to independence. Here you'll get an opportunity to learn from the best, and I'm not talking about me, for after a number of successful years with my own sites, I still find I can learn a trick or two. How will your customers use the Internet? What do you need to build your own web site? It is important to keep your records in order when running your own business as a cross stitch designer. This chapter will help you lay a good foundation for your record keeping. I am sure you will have questions when thinking about becoming a cross stitch designer. I know I did! But unlike me, you now have someone to turn to, for help and advice. When you buy this book you will have access to a password protected page on my site where there is a special form for contacting me with your queries. Additionally, as I mentioned earlier, the download page will also have a link to where you can get FREE graph paper in 11 and 14 count to print out as many times as you like. So don't delay! 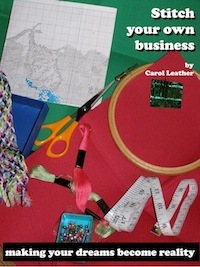 Order your copy of Stitch Your Own Business for just £19.95 today. The book is delivered as an 8.5mb file in .PDF format, straight to your computer. You will need Adobe Reader (the latest version is recommended) installed on your computer in order to open and read this book, if you are using a PC. You can get Adobe Reader here (a new window will open so you can download without leaving this page). If you have any questions about the book, or problems downloading it after purchase, please do use my Contact page to drop me an e-mail. If you are dissatisfied with your purchase for any reason just email me within 8 weeks from your date of purchase - and I'll issue you a 100% refund immediately.